The type of underlayment you need will mainly vary according to the nature of the base that the laminate flooring is going to cover. If you have a concrete or mineral based sub-floor - a damp-proof membrane must be spread to act as barrier to moisture. Also, if the laminate floor is to be installed over an under-floor heating system, a damp proof membrane must be fitted. Other types of underlayment can then be added on top of the damp-proof membrane. A foam underlay is often used to act as a leveler on a sub-floor with minor irregularities. 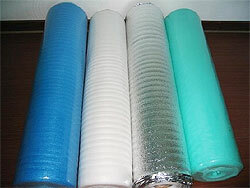 Foam underlay is also effective for impact noise reduction. If you have need a damp proof membrane as well, you can purchase a special 'combination' underlayment, which is a foam that incorporates the damp proof membrane. There is another ‘combination' underlay available, which combines the damp proof membrane with a sound insulator. The most common underlayment of laminate floors is simply known as ‘Board underlay’. This has all the properties required to reduce noise, make the laminate floor feel comfortable to walk on and provides a layer of insulation between the sub-floor and the laminate. Prices starting at $0.10 per sq./ft. Unison 2 in 1 Underlayment is an under-pad to support Laminate and Engineered Wood type floating floors. It provides cushioning and moisture protection. Dimensions: 48" X 25' Roll. Coverage: 100 Sq. Ft. Noise Reduction Laminate Underlay - Most of us have walked on a laminate floating floor and commented on the rather annoying clicking sound that tends to emanate from the traffic. Traditional foam underlay will help to somewhat reduce this noise, but more sophisticated sound control underlayments like Quiet Walk™, Silent Walk™ or SilentStep™ will be much more effective.